Posted March 2 (edited) · Post your latest print! Hey, great idea! Hallo, grossartige Idee! There s no way to niggle the whole time! Man(n) kann nicht die ganze Zeit nur Nörgeln! Time to show some positiv stuff! Es wird Zeit auch etwas Gutes zu berichten! 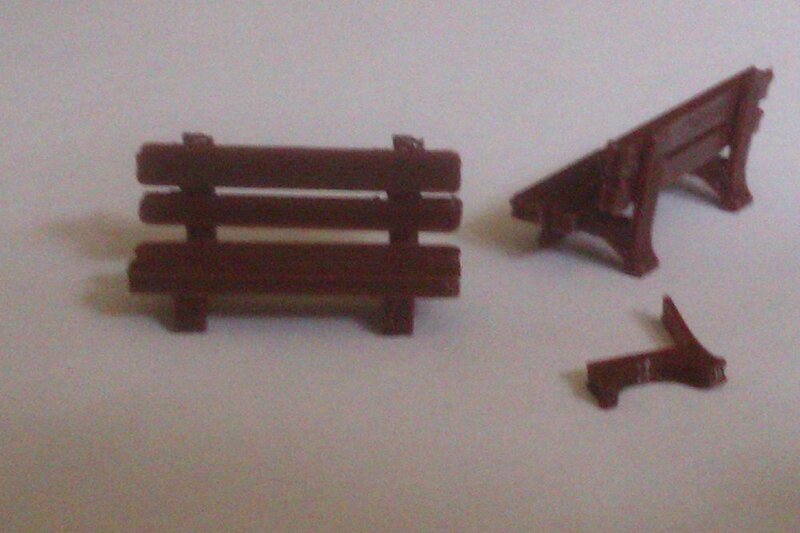 The Picture shows a little park bench for H0 1:87. Das Bild zeigt eine kleine Parkbank für Modelleisenbahn H0. It was created with Lightwave, sliced with cura and printet with an UMO+. Die Bank wurde mit Lightwave modelliert, mit cura gesliced und auf einem UMO+ gedruckt. 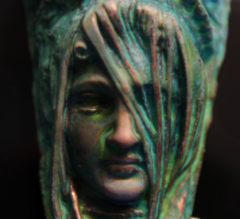 Posted March 8 · Post your latest print! Dr. Hill from Reanimator. The teeth came out great! Damn red is so hard to photograph! I'm going to try to acetone it and wipe the white residue off, but I just can't seem to as others appear to? what am I doing differently I wonder....? There is a spot where the model is hard enough to handle but not too hard, where wiping off works best for me. But I have 100% filled models, so the inside stays hard. I am not sure how it would work with your hollow models with thin walls. It is the left model in this pic. The middle one was heat-gun treated (which doesn't work: trapped bubbles expand due to the heat and explode into craters), and the right one was untouched, if I remember well. For reference: the plates are 10mm wide, and text caps height is ca. 5mm. This is colorFabb Dutch Orange, but it also works with red and yellow. Posted March 14 (edited) · Post your latest print! i tried to wipe off the residue but it didn't seem to work for me. (unhappy face) however I did notice that re-acetoning them about 5 minutes after trying to clean them via rushing and wiping with my fingers that they were a lot less white! my issue is that if i have sanded/scored parts of the model to get it a bit smoother that part goes white much easier than the others. I made a little video, gonna do dr hill next and make another follow up vid! Posted March 28 (edited) · Post your latest print! Hey all ! New here and to 3d printing in general, thought i'd post up one of my first semi succesful prints. Mostly came out ok, had some warpage on the bed because I thought I could get away with a simple brim and not a raft, which seems to almost never work on my Tevo Nereus. Also had several layer shifts, not sure how to fix that yet. Still learning. All in all its still functional and working great ! 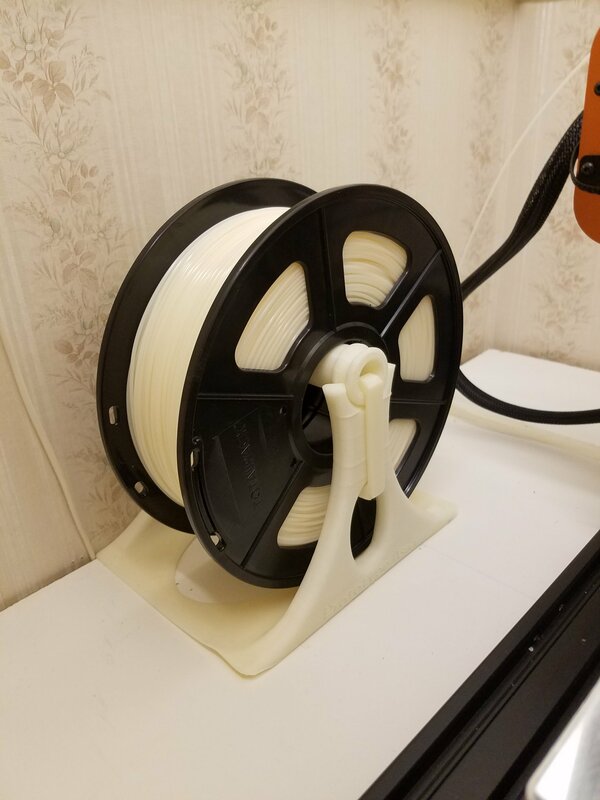 Posted Monday at 07:35 PM · Post your latest print! Here my project from the last weekend. A wall clock, controlled by an ESP8266 microcontroller. The ESP controls a LED stripe to show the current time which is fetched regularly via Wifi from an NTP server. The clock contains 6 segments for the ring and 60 parts for the minute indicators. Red shows hour, green the minute and blue for the seconds. Now I only have to find a nice place to put it on a wall. Posted Monday at 10:34 PM · Post your latest print! Nice, I like it! I ewant to work with leds more... I did a bit back in the day but my friend did all the electronics. I want to do glowing eyes and such on a few of my models. Not sure really where to start, I want to keep it simple and minimal. Posted Tuesday at 12:18 PM · Post your latest print! Yes, with LEDs you can achieve quite nice effects. 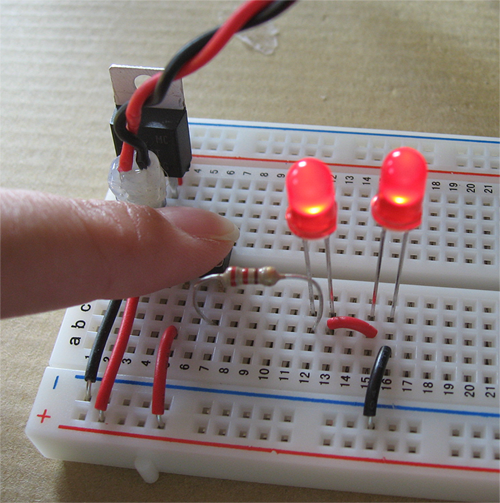 If you only want one LED to light up, it's very easy and you don't need any electronics except a resistor. Posted Tuesday at 04:23 PM · Post your latest print! Google for "simple led circuits" and then select "images". This shows the setup. 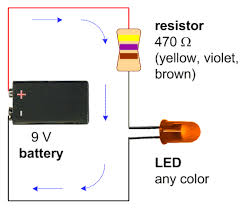 Always keep in mind: LEDs do need a resistor to limit current, otherwise they burn out! Usually the voltage over a LED is between 1.6V (old red LED) and 2.5...3V (blue and white LEDs). The recommended current for a nice illumination can go from 1mA to 10mA usually, depending on the LED. Don't come near the maximum current through the LED, always stay well below 50% of the maximum. - normal voltage over the LED= Vled = ? - recommended current through the LED= I = ? - sourcevoltage = Vs = ? 4) add an on-off switch. That is all. You values may be somewhat different, but this is the principle. But do recalculate the resistor value according to the specs of your LED and your sourcevoltage or battery voltage!!! It may differ. Usually the long pin of the LED is the plus-terminal. And the pin connected to the "dish" inside the bulb is the minus-terminal. Usually, but check it. It only works if you connect the plus-terminal of the LED to the plus-terminal of the battery or source, not vice-versa. Plastic LEDs like these can be grinded or reshaped with a Dremel and cutting disk, as long as you don't hit the wires and chips (also not the very thin wire on top of the chip). But they do get fragile. 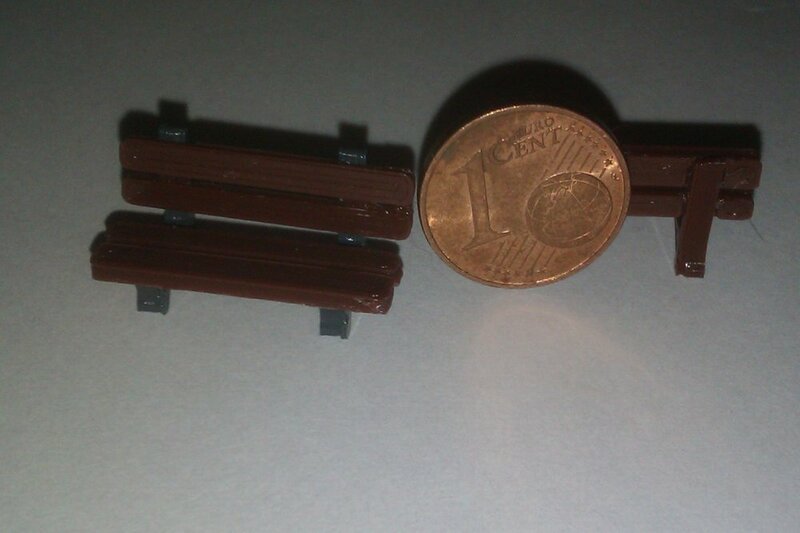 I used to do that in model trains and cars, to make them fit. But don't cut/drill into modern white LEDs. 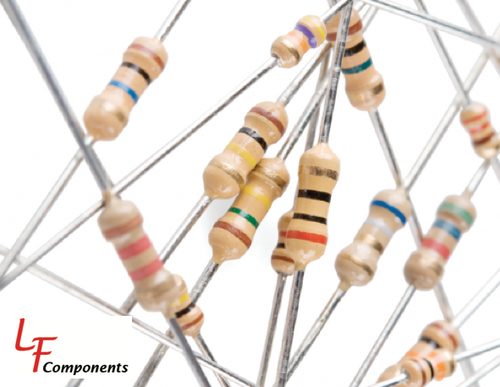 Typical resistors. The color bands indicate the resistor value. Google for it. That is all there is to it. Use a battery charger with short-circuit protection. And/or add a mini fuse yourself. Posted Wednesday at 12:50 AM (edited) · Post your latest print! I'll try the 9V battery first. Ill ask someone to explain to me the basics when i get the stuff, as I know ill just get it wrong, and it will save time at the beginning. Once I've done a few hopefuly I should get the hang of things! Off to ebay/amazon/internet now! one is ok but seeing as ill try for some eyes a lil diagram for two would be nice! 😉 I assume a series circuit or something? not sure how it will affect the resistor requirements? will i need more or is the current good for two if its good for one? Posted Wednesday at 11:52 AM · Post your latest print! 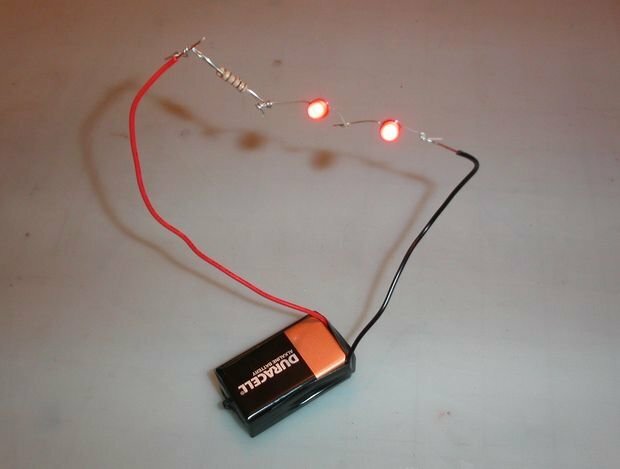 If you use a 9V battery, and you put the LEDs in series, it will work with the same resistor value, but just give a bit less light. 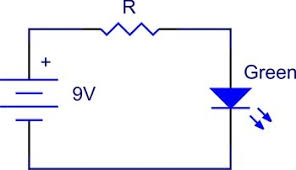 voltage over resistor = battery voltage minus first LED voltage minus second LED voltage. For an educated guess, that would be: 9V - 2V - 2V = 5V over the resistor (as a crude order of magnitude). Use two identical LEDs. And then calculate the resistor, based on the recommended current through the LED. 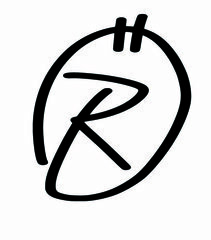 R = 5V / 10mA = 0.5KOhm = 500 Ohm. This value does not exist, so we take a nearby very common existing value: 470 Ohm, or 510 Ohm. R = 5V / 20mA = 0.25 KOhm = 250 Ohm. This does not exist, so we would take 240 Ohm or 270 Ohm. Among the images in Google, you will then also find the color codes. If you are not familiar with electronics, avoid very high power LEDs like those used in spots or in traffic- or billboard signs. 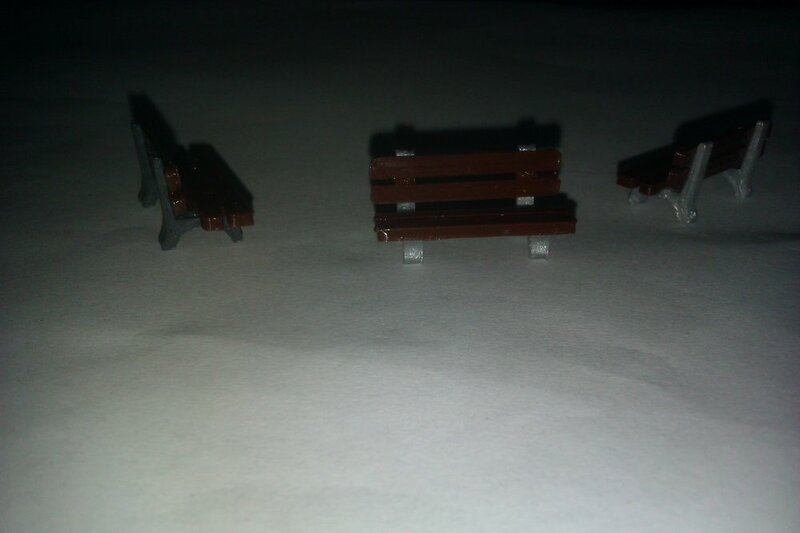 These may get very hot and require special cooling and mounting features. 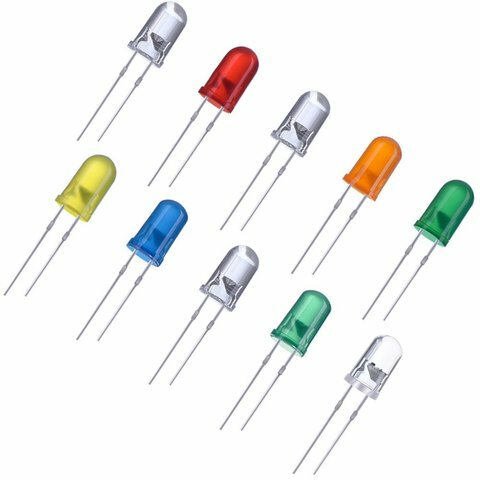 Tiny low power LEDs like in keyboards, stereos, etc..., don't get warm if a correct resistor is used to limit the current to the recommended value. However, solder the wires, instead of wrapping. With this board you can try lots of different resistor values and LEDs in a short time. I used them a lot. So, *always* use a separate resistor for current limiting, and never rely on the very unpredictable internal resistance of batteries, power supplies, or LEDs. This reply is a bit longer than I intended, but fortunately I can type very fast. Also, I realise this is a bit off-topic concerning 3D-printing, but I think it is close enough. It may also be usefull for people who want to modify their 3D-printers to mount some indicator LEDs in it. For example you could mount a LED on the bed heater or on the (cold side of) the print head and nozzle, to see when it is on. Carefully calculate resistor-values (Ohms) and power-ratings (Watt). Posted Wednesday at 01:37 PM · Post your latest print! Also, I realise this is a bit off-topic concerning 3D-printing, but I think it is close enough. Don't worry, it is fully on topic because Cloakfiend has asked for help and your answer is really helpful and perfectly explained. Posted Wednesday at 02:20 PM · Post your latest print!